Fransioli was born in Seattle, Washington, and received a degree in architecture from the University of Pennsylvania in 1930. He worked with John Russell Pope on plans for the exhibition galleries at the National Gallery of Art in Washington, D.C., which he pinpointed as the beginning of his interest in painting. 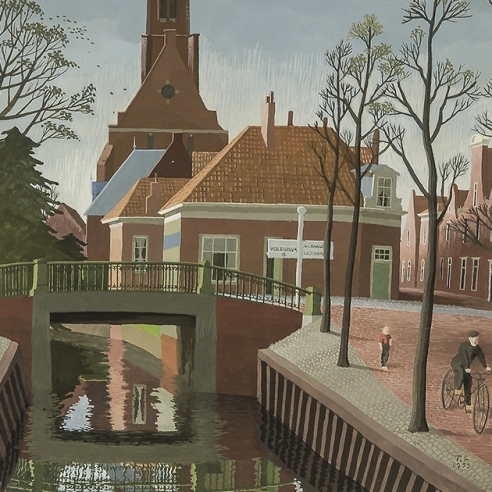 World War II interrupted a promising career in architecture. Fransioli served in the Pacific Theatre from 1943 until 1946, and was among the first American soldiers to survey Hiroshima after the atomic bomb’s detonation in August 1945. He returned to civilian life and took up painting, basing himself in Boston, but working up and down the eastern seaboard. Thomas Fransioli’s cityscapes are crisp and tidy. Buildings stand in bold outline, their forms squarely defined by stark light and long shadows. Saturated color permeates every corner of his canvases, from vibrant oranges and greens to smoky terra cottas and granites. Even the trees that line Fransioli’s streets, parks, and squares are sharp and angular, exactly like those in an architect’s elevation rendering. But Fransioli’s cities often lack one critical feature: people. His streets are largely deserted, save for parked cars and an occasional black cat scurrying across the pavement. People make rare appearances in Fransioli’s compositions, and never does the entropy of a crowd overwhelm their prevailing sense of order and precision. People are implied in a Fransioli painting, but their physical presence would detract from the scene’s bleak and surreal beauty. This is Fransioli, in a nutshell. 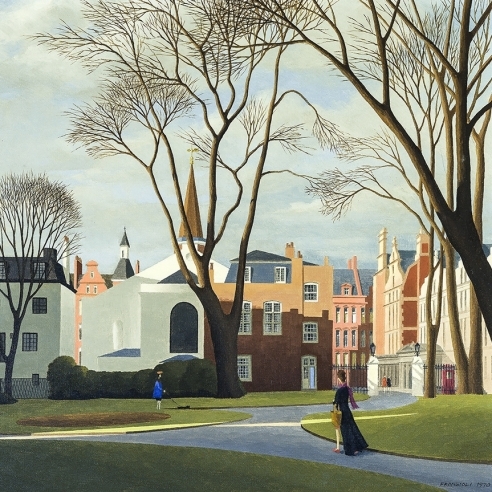 His cityscapes exist in time and space, but certainly not in the manner in which he portrays them. Fransioli—and other Magic Realists of his time—was also the heir to Precisionism, spawned from Cubism and Futurism after the Great War and popularized in the 1920s and early 1930s. 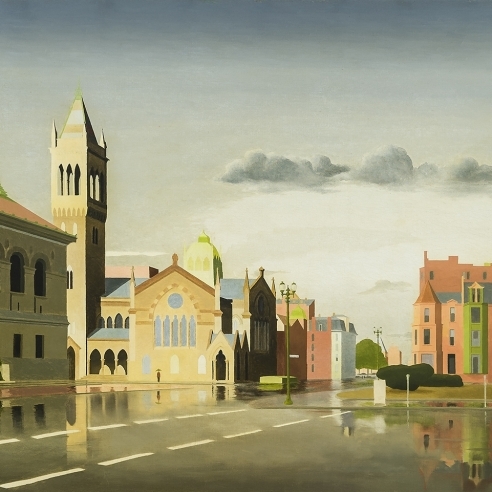 While Fransioli may not have aspired to celebrate the Machine Age, heavy industry, and skyscrapers in the same manner as Charles Sheeler, his compositions tap into the same rigid gridwork of the urban landscape that was first codified by the Precisionists. During the 1950s, Fransioli was represented by the progressive Margaret Brown Gallery on Newbury Street in Boston, and then later by Kennedy Galleries in New York. 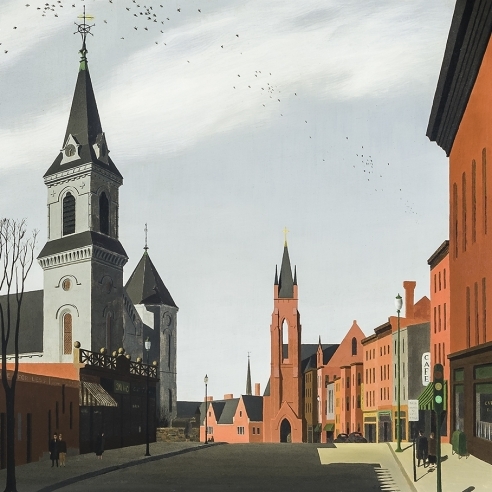 His work was the subject of a retrospective of about 50 pictures at the Farnsworth Museum in Rockland, Maine, in 1954. Today, Fransioli’s work can be found in the collections of the Museum of Fine Arts, Boston; the Currier Gallery, Manchester, New Hampshire; the Nelson-Atkins Gallery, Kansas City, Missouri; the Seattle Art Museum; and in a number of important private art collections.